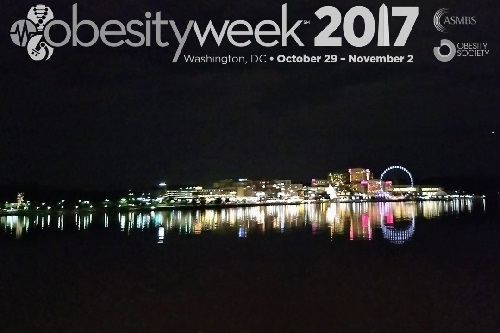 ObesityWeek 2017 is finished. It’s been an intense week with some of the smartest people in the world, dealing with the subject of obesity. Most people don’t really want to think deeply about it. But these people devote their careers to it. So what can we take home. Here are ten ideas that floated to the top. 1. Weight Bias. This was one of those sessions where people spilled out into the hall, eager to hear from three top experts in weight bias. Rebecca Puhl presented newly published data on internalized stigma and self-blame. Each increment of internalized bias cuts the odds of maintaining a healthier weight by 28%. Rebecca Pearl presented strategies for reducing the impact of self stigma. “All providers can listen, challenge, and advocate for patients to fight weight bias,” said Allison Grupski. 2. Fasting and Meal Timing. Another one of those packed-to-the-max sessions dealt with the rhythms of meals. Research presented by Lawrence Cheskin, Krista Varady, and Valter Longo suggest that fasting can be helpful, but we have much to learn about this complex subject. 3. Surgery for Seniors. Ten-year follow-up data from Geisinger on bariatric surgery patients between the ages of 60 and 75 commanded attention. The authors concluded that both sleeves and bypasses could be safe and effective in this population. 4. Social Media. 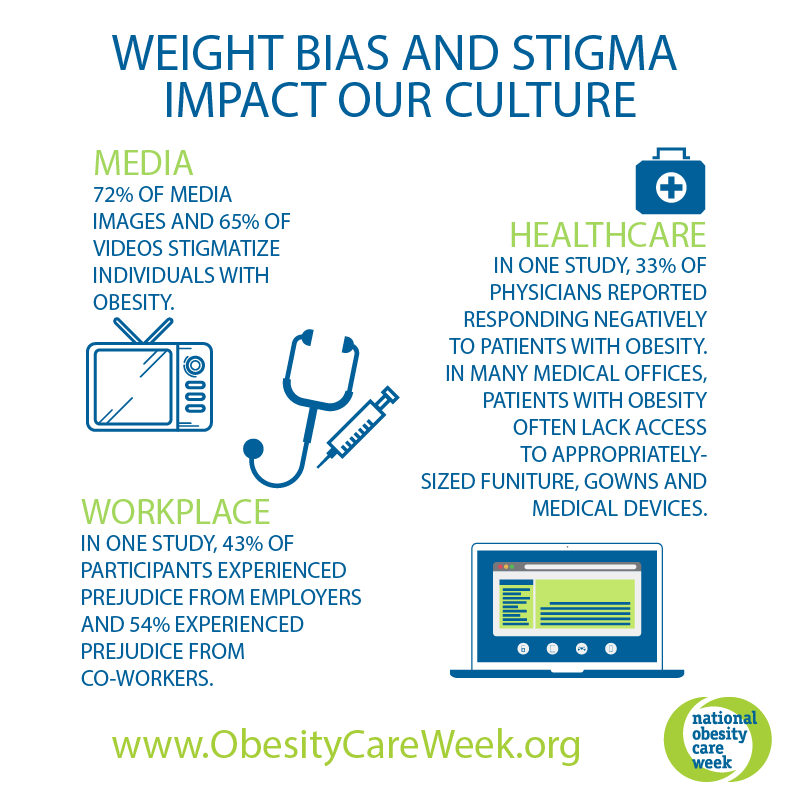 ObesityWeek generated tens of thousands of hits on social media. Neil Floch, Paul Davidson, and Zaher Toumi were everywhere, sharing helpful messages and guiding people to find their voice. We need every thoughtful voice sharing good information. 5. The ACTION Gap. Obesity published the long-awaited ACTION study in the middle of ObesityWeek and it created quite a buzz. The LA Times reports that it “reveals a surprising mismatch between perception and reality of obesity in America. Thanks go to Lee Kaplan for leading on this publication. 6. Big Losers. In the Obesity Journal Symposium, Kevin Hall and colleagues published their latest insights from the reality show everyone loves to hate: The Biggest Loser. “Consistent with previous reports, large and persistent increases in PA [physical activity] may be required for long-term maintenance of lost weight.” Naturally, health reporters loved it. 7. NFL Obesity. This session was an indisputable hit. 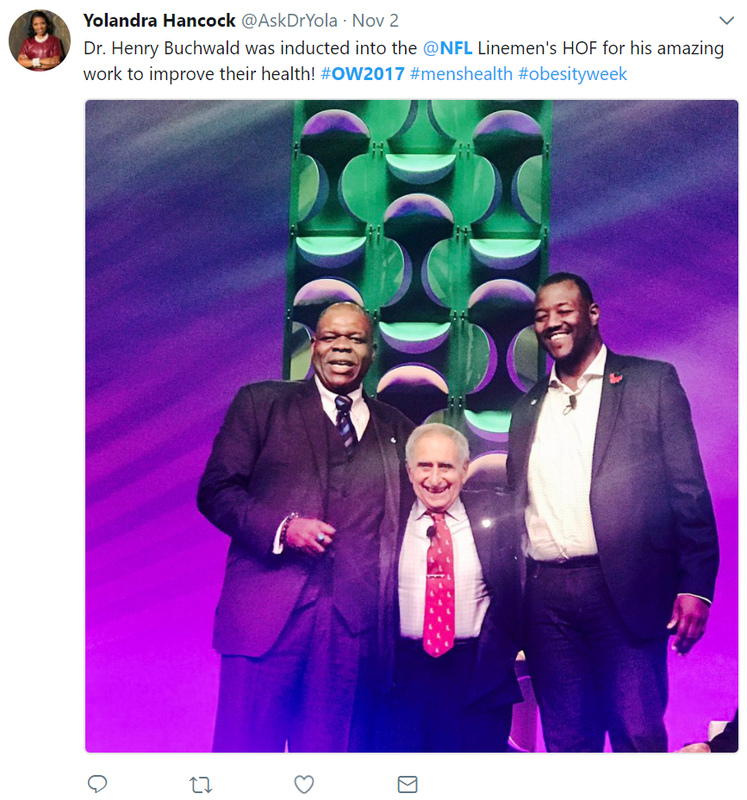 Henry Buchwald, Arthur Roberts, Corey Louchiey, and James Thorton presented a memorable session describing obesity risks for retired athletes. 8. Neuroscience. This was the subject you simply could not escape at ObesityWeek. It started up front with the opening keynote lecture from Rudy Leibel. New data on how teen brains function after bariatric surgery was fascinating. But the meeting provided many, many more insights throughout the week. 9. Waiting for Surgery. It’s hard to believe that any healthcare system would systematically delay access to life-saving care that helps extend lives and reverse chronic diseases. Stanford’s Victor Eng documented wait times that ranged as high as five years. It’s nothing less than shameful. 10. Crabcakes. Being in Maryland, we faced an abundance of very good crabcakes. It’s not junk food, right? So no way could we call this an obesogenic environment. Yum. Thanks for these highlights. Not possible to get to all sessions so these summaries are excellent. #11 or perhaps #1A should be the session on treatment for children with obesity including medications and Bariatric surgery. The specific medications and the specific surgeries were not the most important parts of the presentations. The most important part was the evidence and passion that many children need more than diet activity and behavioral changes. Good questions, Elizabeth. Best answers I have are to keep speaking up, support and empower patients, call out bias, and pursue the science for better answers.